Cloudy Too provided Sue Smith and Danny Cook with another nice prize this season after winning the Peter Marsh Chase at Haydock. Two big wins for Wakanda and the North Yorkshire Grand National success of Lackamon have given Cook the rejuvenation his career needed. His talent has never been in doubt, though, and while he did not need to do much on Cloudy Too, who came home unchallenged, the confidence a jockey rides with cannot be understated. Having run in the Cheltenham Gold Cup two years ago, Cloudy Too (6-1) had badly lost his way but hinted at a return to form in the Tommy Whittle Chase at this track in December. It was hard luck for Gas Line Boy backers, though, as the outsider, having his first run for Jim Best, was the only horse still on the bridle when he fell at the fourth-last. That left Cloudy Too in front and he was unchallenged in the straight with Virak - once more finding a horse from the Smith yard in his path having finished second to Wakanda twice this year - 15 lengths away in second. Fingal Bay was another five lengths back in third, but yet again Reve De Sivola never convinced over fences and was beaten a long way. "It's great to get him back to something like his best," said Cook. "He was a very good horse two years ago but lost his way. 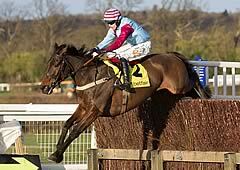 "He loves heavy ground and jumped well. He was responding with every squeeze and I was following Gas Line Boy and when he fell I was left in front and able to give him a breather. "It's a great training performance to get him back and to get a decent prize out of him is great."